Call me a heathen, but this year’s FNB Gauteng Diwali Festival, felt more like an outdoor corporate breakaway than a genuine cultural celebration. To their credit, the festival organisers tried hard to give Newtown’s Diwali Festival a secular slant in the hopes of attracting people of all cultural and religious backgrounds to the event. There’s nowhere better than Newtown to host a festival of this kind. 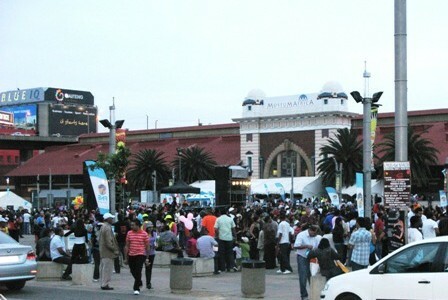 Central, urban, multicultural, and within a short drive of many of Jo’burg’s Indian neighbourhoods, Mary Fitzgerald Square should have been buzzing with celebrants marking the victory of good over evil; and the uplifting of spiritual darkness. In trying to appeal to the whole of Jozi, however, the lights went out on the festival of lights. There simply wasn’t enough Bollywood at Diwali in Johannesburg this year. I’m not suggesting that the organisers cheapen this religious festival, nor do I wish to stereotype Indian culture, but where was the glamour, the celebrities, the music? Oh, that’s right, over on the FNB stage, away from where the locals were eating, shopping, and socialising, being filmed for television. 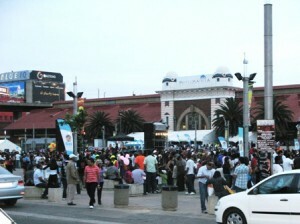 Sponsors FNB stamped a heavy corporate footprint all over the event. Far from appearing genuinely involved with the festival, they blocked off parking for their VIPs, and put a ghastly guests-only marquee up in front of MuseumAfrica. As night fell, Newtown reverberated to the sound of boring speeches instead of throbbing Bhangra beats and classical Indian dancing, as sponsors and political dignitaries congratulated each other for another successful festival before being whisked away by a cohort of blue-light police cars. The Diwali Festival in Johannesburg this year did have some redeeming features. It was a glorious Jozi evening, old fashioned entertainments like men-on-stilts, balloon folding, fresh-spun candyfloss, and flashing LED toys delighted young and old. Samoosas, fried corn, curries, bunnies (bunny chow, that is) and rotis, kept festival goers full and happy till fireworks-time. Whereupon, Mother Nature decided a torrential downpour was the Jozi way to signify the triumph of knowledge over ignorance, and good over evil. But not before dozens of mortars, peonies, rockets, roman candles, and spiders exploded in the night sky, brilliantly, reminding from bankers to bolly-ticians, that Diwali is a celebration of light, gift-giving, and joy – literal and spiritual. Shubh Diwali everyone!